The Current State of DApps on Ethereum and EOS? DApps are similar to apps but instead of them running on a centralized, single entity server, they run on decentralized peer-to-peer computer networks. Even though most dApps run on blockchain networks, there are a number of traditional dApps, for example, BitTorrent, BitMessage, and Tor that run on a P2P network, without a blockchain. DApps are still relatively new and have not reached mainstream adoption yet, but they’re deﬁnitely a trend that continues to grow. The dApp ecosystem is rapidly evolving, and as new blockchains with diﬀerent technologies emerge, the dApp ecosystem evolves along with it. A dApp can explode in popularity one month, only to be eclipsed by a diﬀerent one on a diﬀerent blockchain in the following month. The fast-moving and constantly evolving nature of blockchain dApps makes them diﬃcult to monitor. Luckily, a number of websites have cropped up recently to track their growth. DappRadar and State of the Dapps are two sites that contain a wealth of data about emerging dApps but the data contained in them diﬀers in a number of ways. We used information from DappRadar for this article as it appeared to contain more data. Ethereum has been known for its fairly extensive dApp ecosystem with its most popular dApp last year being CryptoKitties. But the popularity of CryptoKitties brought the capacity of the Ethereum network to its knees, with frustrated users and slow transaction times being commonplace. The EOS blockchain was launched four months ago, and the promise of a faster blockchain appears to have materialized so far. EOS is in its infancy, so the only way to tell if it has sustainable, organic growth as opposed to hype growth, is to observe the dApp ecosystem over time. For this current analysis, we are comparing only blockchain dApps from Ethereum and EOS. Ethereum has been running for a little over three years while EOS is just four months old. All information for the infographic below was sourced from DappRadar.com on October 25, 2018. All the data refers to a 24 hour period of time. Users refers to the number of unique individuals who are engaged with a particular dApp. For the above infographic, only the top 3 dApps were compared, and all the data was taken from a 24 hour time period. On EOS, the most popular dApp, as far as number of users was the precision advertising network, PRA CandyBox with 7,029 unique users. Contrast this to the top spot on the Ethereum network with 1,622 users on the IDEX exchange. On EOS, there was a mix of games and other platforms that comprised the top three spots, while on Ethereum, the top three were exchanges and a high-risk gambling dApp. EOS combined top 3 dApp users in 24 hours: 12,453. ETH combined top 3 dApp users in 24 hours: 3,303. The number of transactions refers to the number of unique data actions that are processed by the blockchains. On EOS, the top three spots with regard to the total amount of transactions were all gambling dApps, with BetDice leading the pack. On EOS, BetDice had a total of 589,794 transactions and on Ethereum, IDEX had 13,828 in total. On Ethereum, the top three spots were a mix of games, exchanges and gambling dApps. EOS combined top 3 dApp transactions in 24 hours: 861,801. ETH combined top 3 dApp transactions in 24 hours: 25,177. 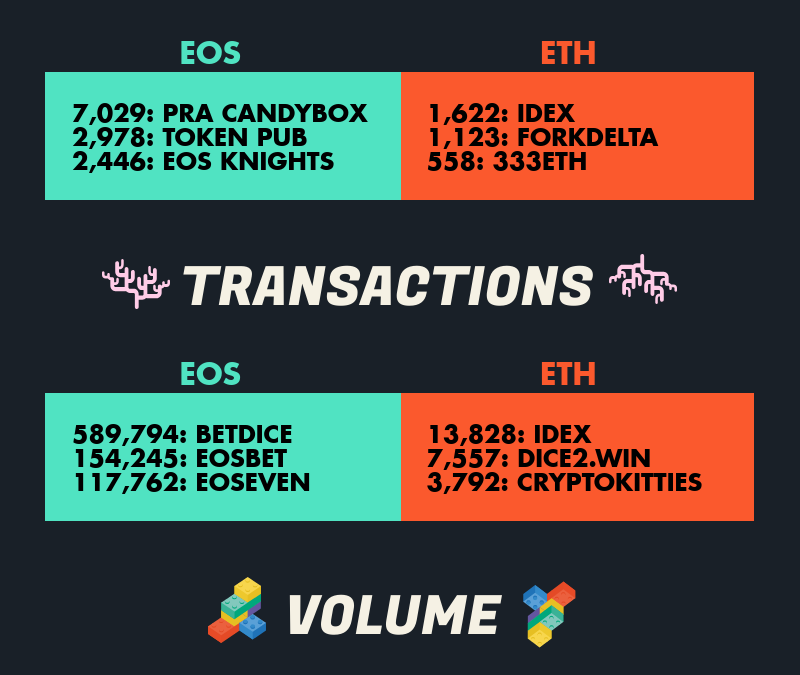 Volume refers to the amount of cryptocurrency coins (EOS or ETH) that moved from one wallet to another. On EOS, not surprisingly, BetDice leads the pack with 2,880,135 EOS. At number one on Ethereum was the IDEX exchange, with the volume at 7,198 ETH. Bancor is a very unique exchange because it relies on smart contracts and a mathematical algorithm when you want to sell or buy tokens. What this means is that Bancor doesn’t have to match particular buyers and sellers together in order to ﬁll a trade. This means that when you use Bancor, you can sell your tokens instantly, instead of waiting for someone else to buy your tokens. If you think about it, this is a revolutionary kind of exchange. Bancor’s vision is to bring exchanges to the next level and create massive liquidity for everyone. Bancor will soon launch an EOS and cross-chain exchange called BancorX. Even though the CryptoKitties craze has passed, this collectible game has spawned a dozen or more copycats, and is responsible for mainstream people dipping their toes into the blockchain world. Even if CryptoKitties brought the Ethereum blockchain to its knees, it still deserves respect for gaining widespread appeal and inspiring a new way of thinking about online collectibles. This game combines blockchain and Virtual Reality technology and offers a unique gaming experience. You are able to train and sell your monsters, build castles plus you can mine a cryptocurrency in the game as well. This game is fairly intricate with egg-laying, health stats, morphing capabilities and levels. The world’s largest encyclopedia on the blockchain, sometimes called Wikipedia 2.0. Everipedia’s IQ Network is the world’s ﬁrst encyclopedia that allows anyone to become a stakeholder in the system and earn rank, rewards & tokens for curating content. KARMA is a social network designed to incentivize users to do good in the world and receive KARMA for helping out mankind. KARMA is currently in its public beta stage, but even so, it’s ranked 16th with regard to amount of users. Why are there so many more transactions on EOS than Ethereum? When you hover over the CUI header, which stands for Capacity Utilization Index, you see that Ethereum is at 100% capacity and EOS is at .30%. This means that Ethereum is unable to process a higher number of transactions than it is currently, while EOS still has the ability to process 99.7% more transactions.